3. An Italian friend, when it poured down as we left the church, said (and apologies for any misspellings): ‘Sposa bagnata, sposa fortunata.’ A French relative piped up, ‘Marriage pluvieux, marriage heureux.’ Hmmm, in English, it would go something like ‘wet bride, happy bride’ – a little odd, methinks. 1. A lovely box has arrived from my fantastic friends at Tesco. I’m hoping it will be chock full of back-to-school essentials and will save me stepping out into the fray …. 2. We finally tried the Maggi Chicken with garlic and herbs. Child One and Child Two were suspicious of its deep, TOWIE-style tan when it emerged from the oven, but Child Three and Child Four ate as though they hadn’t been fed for a week. So a great success with the younger members of the troupe. 3. 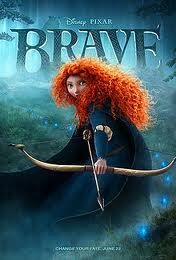 The girls and their cousins, ages ranging from 16 to 7, went to watch Brave last night. They all loved it to bits. I predict a massive hit for clever Disney.